Better even than a multiple monitor set-up, is the multiple computer set-up. A familiar phenomenon for the geek with a laptop for on the go and a desktop computer at home or at work. Instead of splitting your computing power over several displays, you’re putting several disjunct systems in parallel. Then again, it’s almost comical how you have to juggle your computer mice and keyboards. An awkward factor that only increases with the number of devices on your desk. The most obvious way out would be to use KVM switch; a hardware device that connects one set of input devices to multiple computers. Better yet would be to use a software KVM solution, like ShareMouse. ShareMouse does exactly what you would expect from a KVM switch, and more. After installing the application on two computers (or more, after purchasing a license), ShareMouse will automatically spot other computers running ShareMouse on the same network and connect with them. ShareMouse is available for Mac OS X and Windows computers, and will work in both directions. ShareMouse works very similar to Synergy, an application we reviewed Synergy- Multiple Computers On One Mouse & Keyboard Synergy- Multiple Computers On One Mouse & Keyboard Read More on MakeUseOf in the past, but is much easier to get up and running. When your mouse hits the edge of your display, it will jump over to the display of the other computer. You can use either keyboard to type on whatever computer where the mouse is currently located. 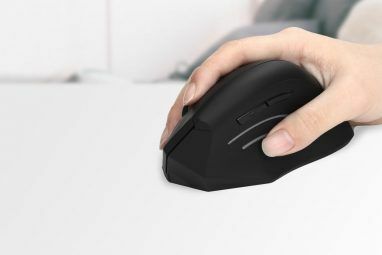 With ShareMouse, you can use one keyboard and one mouse to control all devices on your desk, or you can use the computer you’re currently working on to pull up information on any of the other computers. The main concern for KVM software is the overal responsiveness of the mouse and keyboard while you’re working on a different computer. In this aspect, ShareMouse has hit a home run. Mouse movement is fluid, and there’s no noticeable keyboard delay. Even while using your average Wi-Fi to connect both computers, you could be fooled into thinking you were using the primary mouse and keyboard. 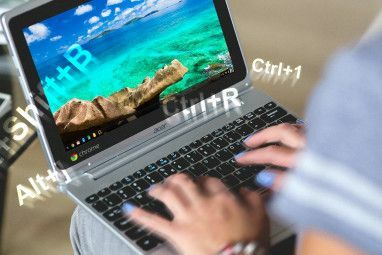 On top of sharing your mouse and keyboard, ShareMouse will also share your files across computers using drag-and-drop file sharing and clipboard sharing. Drag and drop lets you select a files on one computer, and drag it over to another computer. While this worked as advertised on my Windows set-up, it didn’t on my Mac OS X set-up. You shouldn’t expect to rely on these features; there’s no harm in trying, but performance clearly depends on your computer set-up. Rather, you could use Dropbox or a simple LAN connection to share your files across computers. When enabled, ShareMouse will also try to keep your clipboard contents in sync. Of course you shouldn’t expect to copy a multiple gigabyte file, but text, image clippings and smaller files are fair game. Again, sharing files worked haphazardly between Mac OS X Leopard and Mac OS X Lion. Sharing text clippings on the other hand, worked like a charm. In conclusion, ShareMouse works great to share your mouse and keyboard; easy to set up and incredibly responsive. However, there are better and more reliable ways to share files locally. What do you use to tweak your computer set-up? Let us know in the comments! Explore more about: Computer Mouse Tips, Keyboard. I downloaded sharemouse on my two laptops but I honestly still have no idea how to connect them. Does this free version work at all? hi simon, oops! i thought i was writing to someone who works for ShareMouse -- i was referring to them and their website. hi simon, i just downloaded the windows 7 version from cnet (the one on your site didn't work), and i was able to install it easily. i can't install it on my mac, however, i tried downloading from both your site and cnet, and the "box" ShareMouseSetup.pkg shows up on my desktop, but nothing happens when i click on it. can you please help me? i can't find any information on the web about troubleshooting problems with the install on a mac (10.6 snow leopard). i also tried your forum but found nothing. ALSO your website is extremely slow -- very very very slow -- disturbing from a tech company! thanks in advance for your help. I tried ShareMouse and it works really well except for swipe gestures on the Magic Mouse. The mouse cursor would be on one mac and the swipe gestures would control the other one. If they could fix that it would be great. Teleport works with swipe gestures but can often take a few seconds switching from one mac to another. Very disappointing that the initial pleasure that my netbook, (on the left), my desktop, (in the middle), and my lappy, (on the right), all worked well with the desktop keyboard and mouse. For five minutes - when the desktop decided it shouldn't be working as it is a commercial machine for some reason unfathomable to me, and it stopped working with the other two. Note that all three PCs are on the desk next to my bed, in my bedroom, for personal use only. I'm sorry you felt that way. There are two ways this could've happened. 1 - Using ShareMouse on more than two computers requires a license. 2 - ShareMouse can spot some professional-grade software, like Adobe CS and CAD software. If it does, it decides you may not be telling the truth about "personal use". i just downloaded the windows 7 version from cnet (the one on your site didn't work), and i was able to install it easily. i can't install it on my mac, however, i tried downloading from both your site and cnet, and the "box" ShareMouseSetup.pkg shows up on my desktop, but nothing happens when i click on it. can you please help me? i can't find any information on the web about troubleshooting problems with the install on a mac (10.6 snow leopard). i also tried your forum but found nothing. ALSO your website is extremely slow -- very very very slow -- disturbing from a tech company! sorry, i didn't mean your site, i meant sharemouse's site. The Mac version can be downloaded from the ShareMouse website as well. It's indeed a .pkg file, and should start installation when you open it. If you previously downloaded the 64 Bit installation file, you might want to try the 32 Bit installation file instead. If that doesn't solve your issues, you can contact Sharemouse support directly. This sounds very unique, although the design of ShareMouse is quite basic. This is a very cool app! No more juggling with extra mouse and keyboard. Super !!! ShareMouse and Mouse Without Borders both support only MacOSX (Snow Leopard or Lion) and Windows. No support for Linux. Is there a hack to make Linux accessible for these products? I've been using Synergy for quite some time without problems, once I got it working, and it meets my needs very well. In almost all cases my "other" computer is running Linux (and potentially both computers). My main complaint is that exiting the monitor on my media computer essentially sends an ESC signal, switching off Full Screen mode, so I use a separate KM for that system. If you want a solid virtual kvm, I'd highly recommend some freeware named SYNERGY. It works across multiple OS' (Windows, Unix, etc.) and allows seemless use of the keyboard & mouse as well as copy/paste across desktops. It uses your network to link your KM control.and the setup is pretty straight-forward. I've only seen an issue with it once, and that was because the dns entry for one of the pc's was improperly cached on the pc...dns refresh took care of it. I setup several users at our company with Synergy and now they don't know what they would do without it! For users working on 2 pc's and with dual monitors, I setup their primary workstation to display across both monitors -- then when they want to use the secondary workstation, they simply change the input on one of the monitors (the one without the taskbar) and then have both pc's up at the same time with seemless KM/clipboard control between them. If they want to go back to dual screen for their primary, just switch inputs on the monitor once more. Even for my 'problem-users' (you know, the ones that have more pc issues than everyone else combined) have been using this software without a problem. Benefit over DropBox is that you don't need to upload/download all your files to external servers over the internet and drag & drop is much more intuitive than having to open your DropBox folders on either side. Perhaps, you just have a minor firewall issue as drag & drop uses different network ports than the remote control part. Would http://manual.keyboard-and-mouse-sharing.com#ts help? Thank you for your response. The problem was with OS X Snow Leopard < -> Lion, and both computers cleared the troubleshoot checklist you sent. ShareMouse worked like a charm in general (kudos), but drag-and-drop just didn't respond. Any files that were being dragged were released when I hit the monitor edge. Also, if it wasn't entirely clear from my article, I still suggest trying ShareMouse over the other alternatives. If drag-and-drop works for the reader (as it will for a lot of other people, I reckon), all the better! As I recall, I tried ShareMouse once before. It worked fine on two (2) machines, but the vendor wants being paid if more than two (2) machines are connected, making it useless for my purposes (four (4) boxes, eight (8) monitors). However, it did seem to work well on just two (2) boxes, although not well with two (2) monitors per box. It's pretty much a minimalist approach to the problem. Maybe the paid version would work better, but I don't have any way to determine that, do I? Synergy/Synergy+ works - sometimes - but gets confused by even minor complexity. Input Director, despite its failings (e.g., clipboard failures, connectivity losses), works. If you're using only Windows computers, I would advise Mouse Without Borders. also I don't know how it behaves with multiple monitors, it handles copy/paste between computers pretty nicely. Mouse Without Borders doesn't like multiple monitors, either. And it tends to strain with the third and fourth systems, although I does work with them with single monitors. All of these kvm replacements have trouble functioning above the number two (2), 'twould seem. @kenijo: Please check out http://www.keyboard-and-mouse-sharing.com/mouse-without-borders-alternative.htm to learn more about the differences between ShareMouse and 'Mouse without Borders'. @Barnley: ShareMouse supports up to 26 computers and monitors. Thanks for letting us know about the monitor cap, we'll add it to the article to avoid confusion.